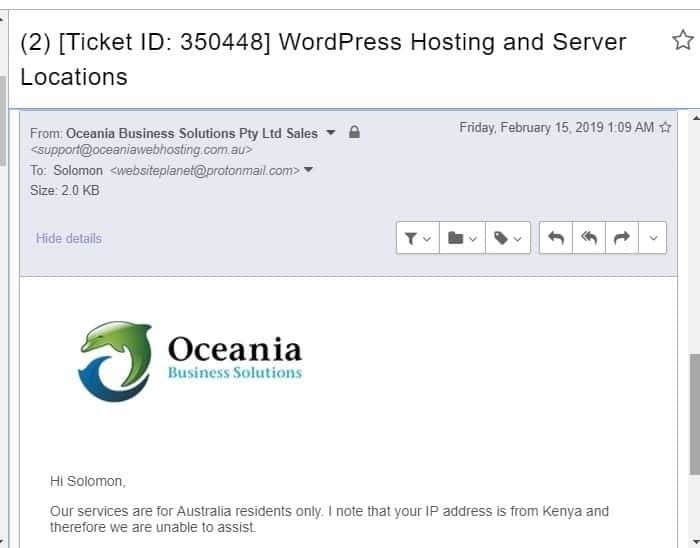 Oceania Review 2019: Is Oceania a Good Hosting? Oceania is a web hosting company based in Australia. The vendor has been providing website hosting services to business enterprises since it was established in 1999. It offers web hosting, VPS, and dedicated server solutions to Australian businesses only. Founded in 1999, Oceania is a relatively small web hosting company based in Australia. This hosting provider offers a wide range of hosting solutions including shared web hosting, VPS, and dedicated servers. Over the years, this vendor has sought to offer affordable yet reliable web hosting services to its customers in Australia. The vendor’s data centers are located in Canada and provide the backbone on which it offers its hosting solutions. Oceania’s servers are housed in state-of-the-art data centers located in Canada. The data centers use high speed servers with RAID 10 configuration for data protection and high performance. In addition, the core infrastructure has both IPv5 and IPv4 protocols ensuring maximum availability. Oceania shared web hosting solutions come in two packages. Users can choose between WebSTAR hosting plan or WebPRO hosting plan. 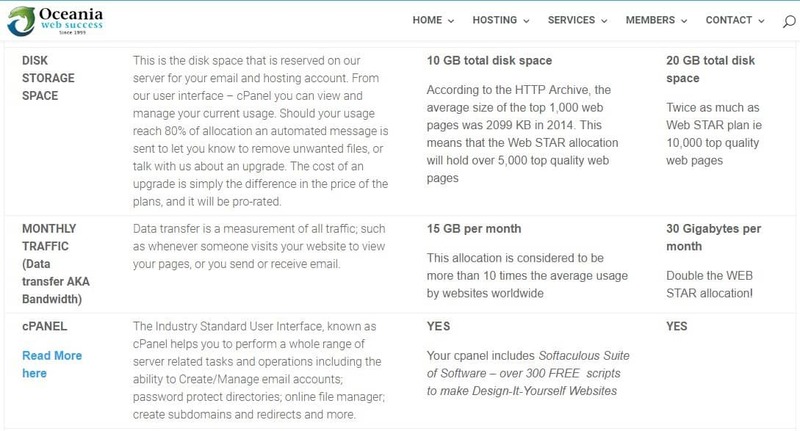 The WebSTAR hosting plan is ideal for small enterprises and comes with 10GB disk space, 15GB monthly traffic, and two add-on domains. While WebPRO hosting plan includes 20GB disk space, 30GB monthly traffic, and five add-on domains. Although Oceania hosting solutions include free daily backup services, the vendor claims that its backups are primarily for its own recovery purposes. Therefore, customers are solely responsible for the storage, backup, and archiving of their accounts. The vendor allows its customers to perform these backups through its easy to use cPanel control panel. It is worth noting that Oceania has made available customized hosting solutions; the vendor designs these plans according to your particular requirements. Therefore, whether you are running a blog or a large website with lots of traffic, you can choose the necessary resources that best suit your needs. Oceania hosting plans are quite expensive. Due to the fact that the hosting plans come with pretty basic features, I would say that they are not worth their price tags. The prices of these hosting plans are listed in Australian dollars and are available in flexible billing cycles that include monthly, quarterly, and yearly subscriptions. Oceania offers a 30-day money-back guarantee for new customers and all its hosting plans come with a 99.99% network uptime guarantee. You can contact Oceania support team via telephone or ticketing system. The vendor has not availed a support email or live chat on its website. However, it has published a support email on its Facebook Page. The vendor’s technical support desk is available 24/7 and is highly responsive. I sent them a support email and heard back from them in just four hours. Oceania has a fairly detailed knowledge base, as well. Oceania web hosting solutions are ideal for businesses of all sizes, including large corporations. However, it is important to note that the vendor does not offer hosting solutions to individuals and businesses outside of Australia. But for business organizations in Australia, the vendor has excellent solutions, including customized enterprise hosting services. Wondering how Oceania stacks up against other Web Hosting companies? Enter any other Web Hosting company and we will give you a side-by-side comparison.